On Sunday, 11th September Diddy Rascals spun the decks and partied hard at Hackney One Carnival. Thank you to all who came down to party with us. We had a blast! Diddy Rascals to play Hackney One Carnival main stage! This Sunday 11th September, Diddy Rascals takes to the main stage from noon-1pm in Hackney Town Hall. Our super-cool guest DJ Sharon Bowen will be pumping out the best in club classics to get the mums, dads and kids of Hackney up on their feet and jumping to the beat. But that's not all. We'll also be giving away FREE face painting on the OSLO terrace and throwing our 'Back To School Bonanza' in the OSLO main club space above. So, be sure to come and say hello and have a proper dance around – carnival style. There's also 20% off your bill in the OSLO kitchen - perfect! Hackney is definitely the hottest place to be in London this Sunday so pack up the kids, grab your feather bowers and groove on down to the OSLO. Winners of the 8th independent toy awards have been announced this week. Diddy Rascal’s favourites include a ‘glow and giggle’ playmat to get your babe boogie-ing, a Disney Princess night light and projector (for a rave at home when you can’t get to ours!) and the Get Emojinal Sound Machine – perfect fun for pranksters. Organised by Toy Shop UK, over 900 retailers voted for the best and most popular in 25 categories. With a gold, silver and bronze winner in each category, that’s surely enough ideas to pack your Rascal’s stocking this Christmas! HAPPY BIRTHDAY TO OUR ORIGINAL DIDDY RASCAL! This week our original Diddy Rascal Miss 'Conker' turns the big three! Having parents who throw parties for a living has its perks and we can't wait to watch her blow out her birthday candles... Diddy Rascals-style of course. Happy Birthday little 'Conker'. Thanks for being the inspiration to something we are all very proud to be a part of. CARFEST SOUTH YOU WERE AMAZING! We turned the famous big top tent into a inflatable fun factory that created a perfect atmosphere for all to enjoy. Our resident DJ was mixing up a storm on the decks while Master Rascal was throwing some serious shapes on the dance floor. With perfect weather and perfect ravers Diddy Rascals big top tent takeover blew the roof off! Check out the Red Arrows air display below... We should have gone into movie making. Rascals start your engines and get ready to party hard at CarFest South! 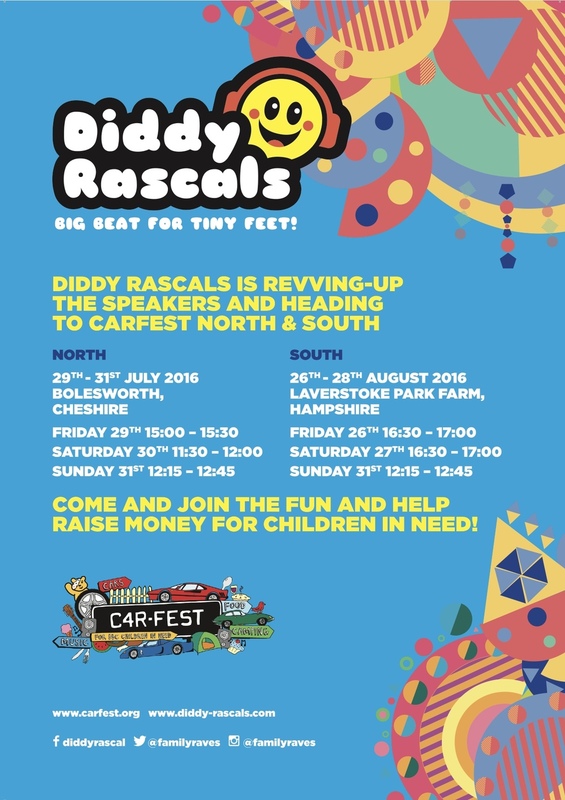 This weekend sees the Diddy Rascals crew packing up the speakers and heading to CarFest South. We will be turning the Big Top tent into an inflatable fun factory for all our 'Diddy Dancers' and 'Ravin' Rascals'. As usual our resident DJ will be playing a heady mix of club classics and old school funk to get those little wellies stomping to the beat. There are tonnes of other cool activities for the kids to get stuck into, so be sure to check out the CarFest website for all the goings on! Don't forget to share your favourite snaps of your 'Diddy Dancers' in action using the hashtag #diddyrascalssouth ... we know you love a hashtag. Drive safe and see you in the Big Top! Here at Diddy Towers we wanted to share some love and vouchers with all you 'Family Ravers'. GUEST DJ TRONIK YOUTH LINED-UP FOR BALHAM FAMILY RAVE! Diddy Rascals is thrilled to announce that Tronik Youth will be spinning the decks at our newest 'Family Rave' at The Bedford in Balham on Sunday 7 August. He'll be playing an eclectic mix of old, new and original club classics to get everyone up on their feet and grooving to the music. This is one event not to be missed! To book tickets for this event, head over to our Events Page where you can also check out all of our upcoming 'Family Raves'. In the meantime, check out this awesome Tronik Youth mix... Happy listening. Time flies when you’re having fun, and here at Diddy Towers it’s a 24-hour party planning your favourite ‘Family Raves’. Today we can announce we are packing up our speakers and heading for the great British countryside. The end of this month (29-31 July) sees us at CarFest North in Bolesworth Castle in Cheshire, and on 26-28 August we’ll be at CarFest South in Laverstoke Park Farm in Hampshire. For the uninitiated, CarFest is an annual festival that brings a fabulously eclectic mix of music, cars and family fun. It was set-up by TV presenter Chris Evans back in 2012 and it’s also a fundraiser for Children in Need. As well as cars (obviously), the festival has a whole host of other activities, from music to food – and Diddy Rascals, too! Yes, the Diddy Rascals team will be there to get the party started, bringing you music, soft play, dance, a ball pool and lots, lots more. And you’ll be supporting a great charity, too. So grab your tickets and see you there! Here at Diddy Towers, we take the business of fun very seriously. So much so that we have joined the Family Arts Campaign, in association with entertainment charity the Arts Council, to bring you the best party in town. In other words, entertaining and engaging your Diddys through play and education. We don’t just throw these parties together, you know. Oh no. Our events are carefully crafted. From the music to the play areas – and even the goody bags – each element has been conscientiously created for your little ‘uns. With so much consideration going into each event, you can rest assured that your Rascals are going to work both mind and body in a fun-filled, brain-busting day out to remember. But don’t just take our word for it – we’re approved by the Family Arts Campaign. So what are you waiting for? Grab your tickets and come and join the party. If you’ve never attended a Diddy Rascals event, then we’re sure you’re wondering what exactly goes on at one. Well, we’re here to tell you right now. Firstly, you’ll need to buy your tickets in advance. Simply follow the link from the Event Page and you’ll be taken to our ticketing partner, EventBrite. Then all you have to do is rock up to the show with your printed ticket and get set to party. The first thing you’ll notice is the music – not too loud so as not to damage your Diddys’ ears. Our DJ plays all the latest club classics to get those tiny feet onto the dancefloor. It’s the perfect spot to burn off all that excess energy – while giving us mums and dads a bit of breather. Phew! If dancing isn’t their thing, then there’s always the ball pool – and what kid doesn’t love diving into a pit of colourful plastic balls? Don’t forget, it’s strictly for Rascals only! Imagination is an important part of child development, and our soft play area allows your little ‘uns the space to have fun in the way they choose. There are tonnes of toys available, so there’s plenty of scope to inspire young minds. But the fun doesn’t stop there. There’s also face painting on site, as well as a goodie bag to take away. All that’s left is for you and your family to come along and join the fun. Hello and a warm welcome to the Diddy Rascals blog spot. Here you’ll be able to keep up to date with all things Rascals related, as well as tons of other advice. But first, let us walk you through what we do and how to use our wonderful website. Here at Rascals Towers, we’re dedicated to FUN and our kids’ raves are arguably the best in town. Our DJs play the latest club classics so your Diddys can dance their little socks off. There’s also face painting, a soft-play area and ball pool – whatever takes their fancy. And it all takes place in our safe and secure fun factory. But don’t worry, we haven’t left out the adults. There’s plenty of space for you to relax and enjoy a drink and some food while your little ‘uns left off some steam. Let’s face it, we could all use a breather – who can keep up with that much energy! Finding out about Diddy Rascals events is easy, too – just follow the link to see when we are coming to a town near you so you can grab your tickets before they sell out. Want to know more about Diddy Rascals? We have years of experience in the entertainment business so we know how to throw a party. Coming soon will be our image gallery – a great way to see all our Diddy boys and girls having fun. So what are you waiting for? Come and see what all the fuss is about. Book your tickets for our next event and we’ll save you a space on the dancefloor.